Helen Louise Price died Sunday, November 18, 2018 at Aldersgate Village, where she was a long-time resident. 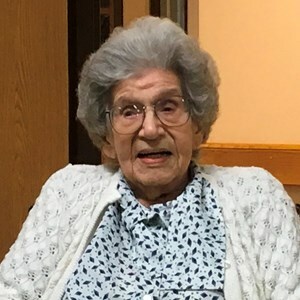 Born on May 27, 1918, Ms. Price was the only daughter of Gratton P. and Lena Goggin Price, who moved to the Emporia area in the early 20th century to farm, and who preceded her in death. She is survived by many cousins from the Price and Goggin families. A 1935 graduate of Emporia High School, Price earned a Bachelor of Science degree in Education with a library certificate from Kansas State Teachers College, now Emporia State University. This education prepared her for a long career as a librarian in Oklahoma and Kansas, including 30 years with the Veterans Administration. During her years as a librarian for the VA, Price provided research assistance and library service for the work of Dr. Karl Menninger, who made important progress in the treatment of veterans in need of psychiatric care, and who is widely known as a founder of the Menninger Foundation and the Menninger Clinic in Topeka. Dedicated to her profession, Price was an active member of the American Library Association and the National Active and Retired Federal Employees Association. She was also an honorary member of the American Association of University Women. Price maintained a life-long interest in history, serving the community as a museum docent and her family as an authority on its history and the lines of kinship among its members. She was a faithful member of the First Baptist Church of Topeka. Memorial gifts may be made to the First Baptist Church, 3030 SW MacVicar, Topeka, KS 66611. Funeral services will be held at 11:00 a.m. on Saturday, December 1, 2018 at Dove Southwest Chapel, 3700 SW Wanamaker Road. Burial will follow at Memorial Lawn Cemetery in Emporia at 1:00 pm. The family will greet friends one hour prior to the service at the funeral home. Add your memories to the guest book of Helen Price. Helen hired me for my first really good job--in my career choice--librarian. It was in 1975--she hired me site unseen--it was an interview by phone. I lived in Iowa City Iowa at the time--I had just graduated from Library School==a Master's degree. I was desperately looking for a job--hopefully in my field. I sent resumes all over the country. Then low and behold--I got a call from the VA Medical Center in Topeka, Kansas. Helen hired me--like I said--site unseen. So I packed up and moved to Topeka, Kansas--where I have enjoyed a wonderful career and rewarding job. I retired from the VA in Feb 2013.. I retired to take care of my mother in Council Bluffs, Iowa. A friend of mine--and former boss--Nancy Vaughn--told me about Helen's death. Helen was a real lady--.. At work, we addressed each other with Miss or Mrs. (and last name). A little formal, but she was a magnificent and magnanimous boss. She retired shortly are I got hired--perhaps in 1976 or 1977. Then I had a wonderful career and another fantastic boss, Nancy Vaughn--whom Helen mentored. I would not have been this lucky had not Helen hired me. I thank God she took a chance on me. memory for people and places. She was mild-mannered; I cannot imagine her raising her voice. members with the longest tenure..37 years in 2018. Helen was a treasured member of our Topeka Travelers Club. It was good to visit with her there and we will all miss her. My deep sympathy goes to her fanily. I admired Louise from the time I was a little girl. I grew up on a farm north of the Price farm. Mrs. Price would invite me to come and have cookies when Louise was home from college. Louise would share information about her studies, which I found exciting and interesting. I was inspired by her accomplishments ,and I eventually went on to obtain two college degrees, in part, because of those visits with Louise and Mrs. Price . Louise was 22 years older than I ,but when I became an adult, we exchanged Christmas letters and cards. I admired her manners, her kindness , her intelligence, and her beauty. I recall one day when I rode my horse down to the Price farm. ( I was about 10 years old) Louise was there. She was dressed beautifully for an event and was standing by her car. I still see that picture in my mind....at the time I thought when I grow up, I want to be as beautiful as Louise. She was a fine woman. My sympathy to her family. Helen, as we knew her, was a very good friend of my Sister-In-Law, Dorothy Blush Harrison. They both worked at the VA. She attended many of our family birthdays and anniversaries and we considered her part of the family. Also knew her Mother, Lena. We extend Sympathy to her loved ones. Louise was the daughter of my paternal grandmother’s sister, Lena. I grew up knowing Louise through family gatherings and hearing stories about her from my grandmother. I was not as close to her in later years as I would have chosen to be because of the logistical distance between us, but she was quite a brilliant woman who gave so much to her profession, to her church and to her community. She was a real trailblazer, especially for her generation!